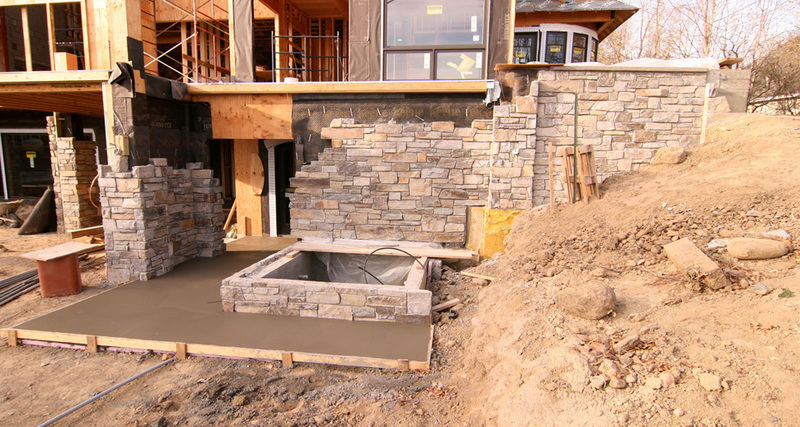 This gallery visually shows you how much work goes into each project. 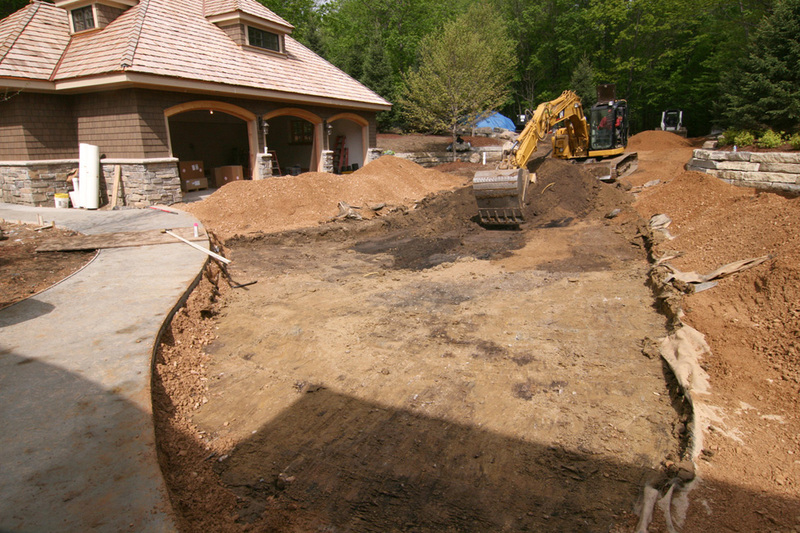 This current “work in progress” is a major lake home remodel. 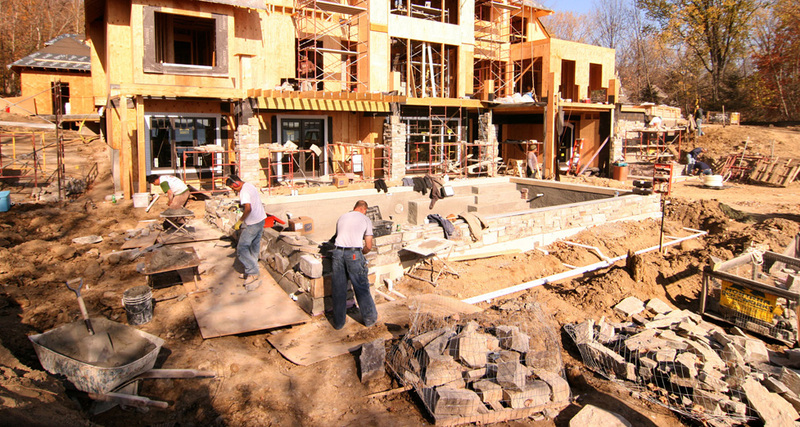 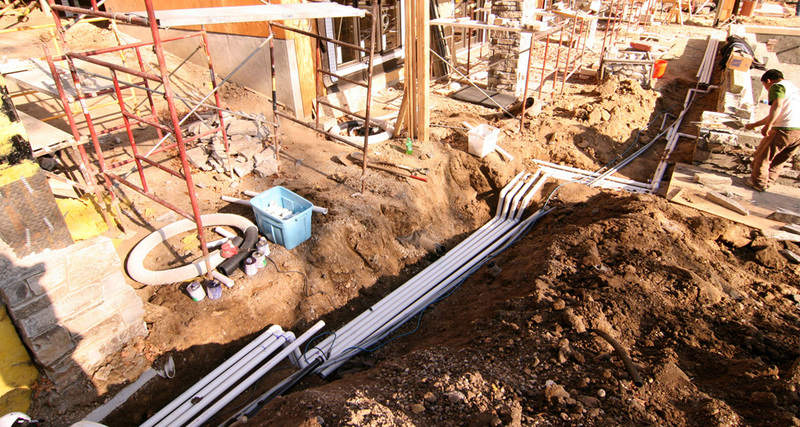 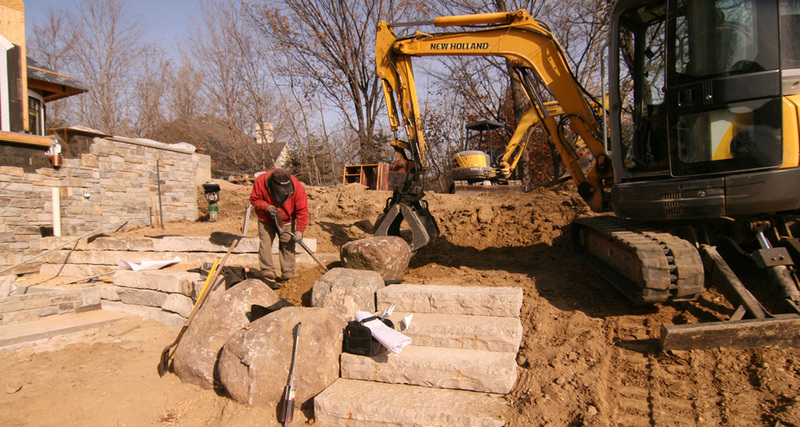 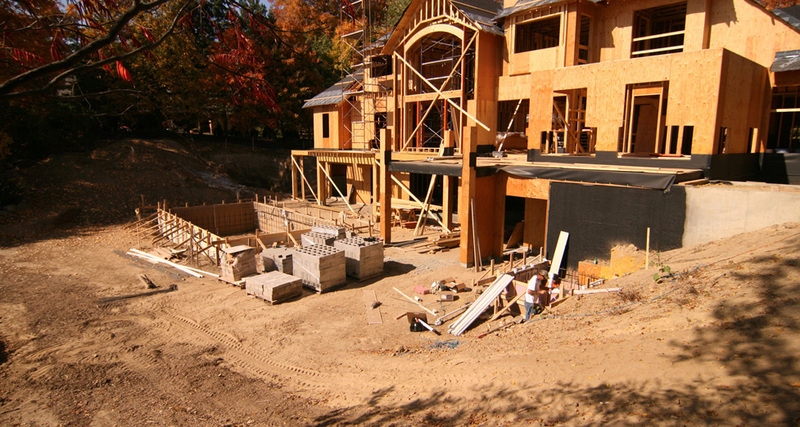 We were called in on the project early on when the home construction was about to begin. 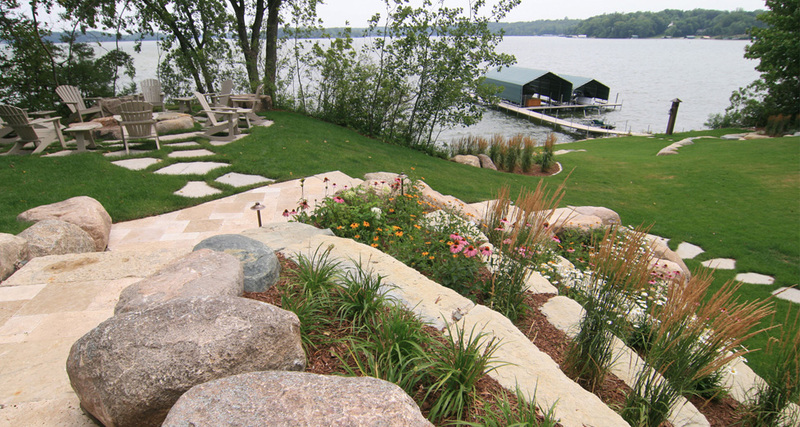 These homeowners decided to down size and sell both, their lake home in Northern Minnesota and family home in Bloomington. 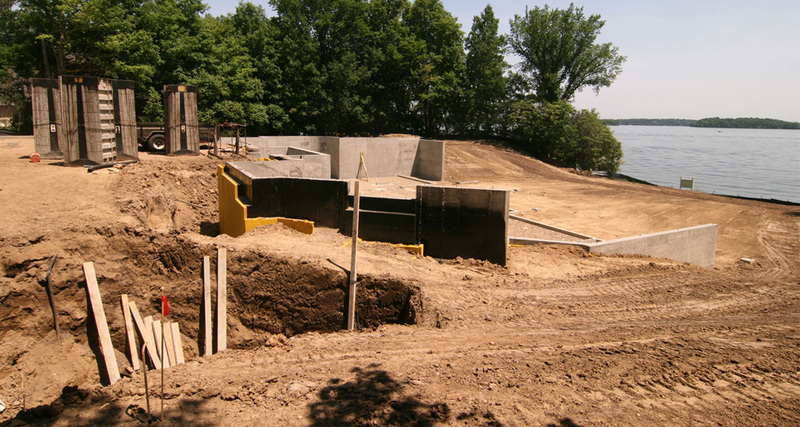 They purchased a lot on Lake Minnetonka to build a home that encompassed both of their previous homes into one. 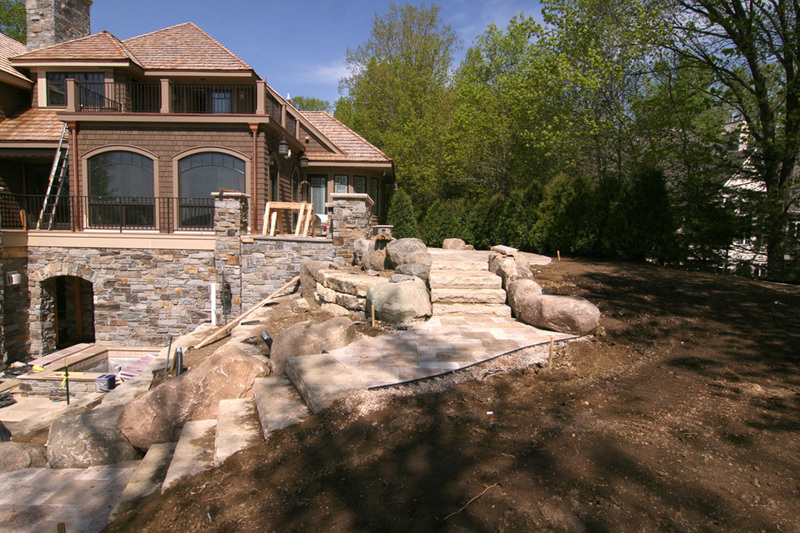 The Lake Minnetonka home was placed on the site close to the lake shore to take advantage of the views of the lake. 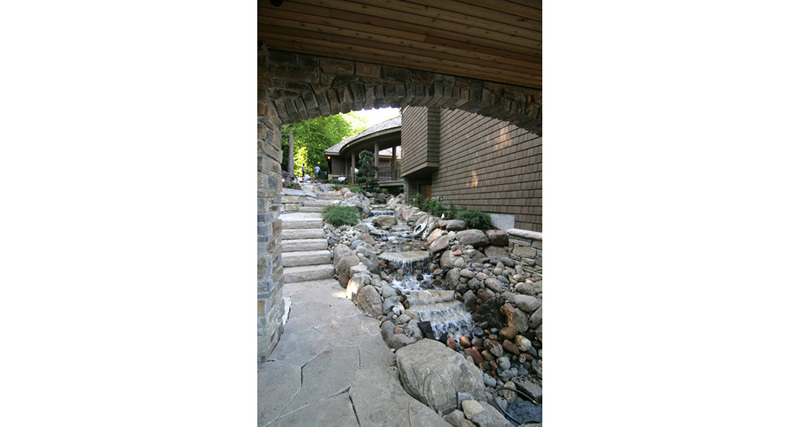 They also created a lower level walkout, as well as a patio area for entertaining, and accessing the lakeshore. 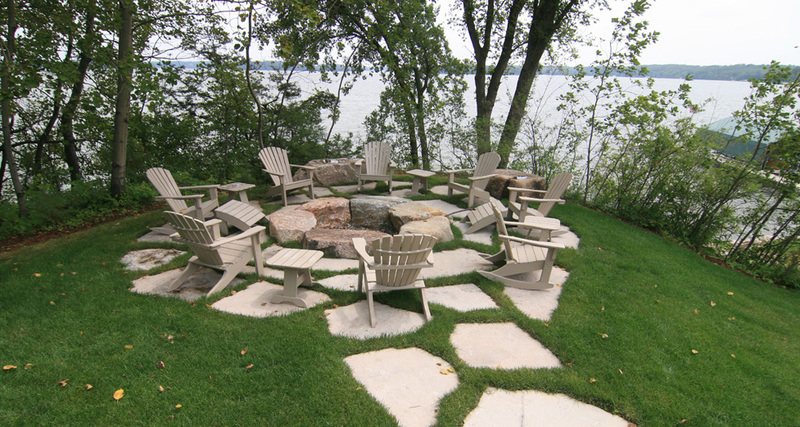 This Lake Minnetonka home was in need of an entertaining space with lots of room and activities for their children and grandchildren to enjoy. 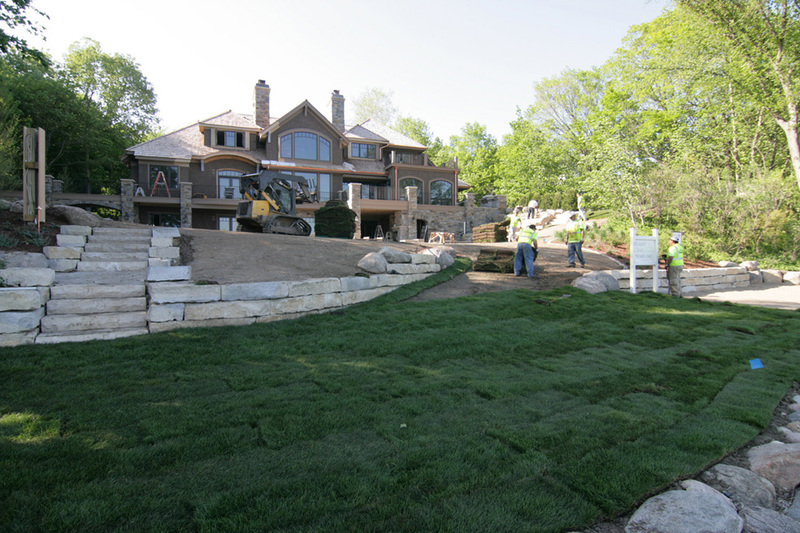 Yardscapes created a “half” in-ground swimming pool, so that the edge of the pool could be used for additional seating. 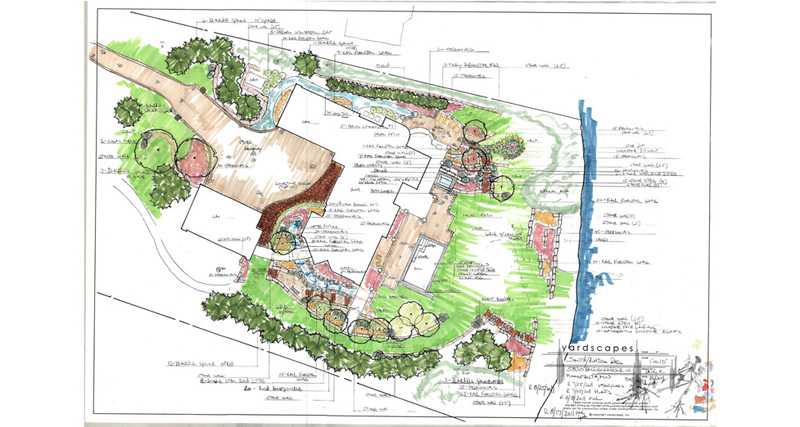 They also wanted a fire pit area, a spa, outdoor kitchen and large lawn space to run around in. 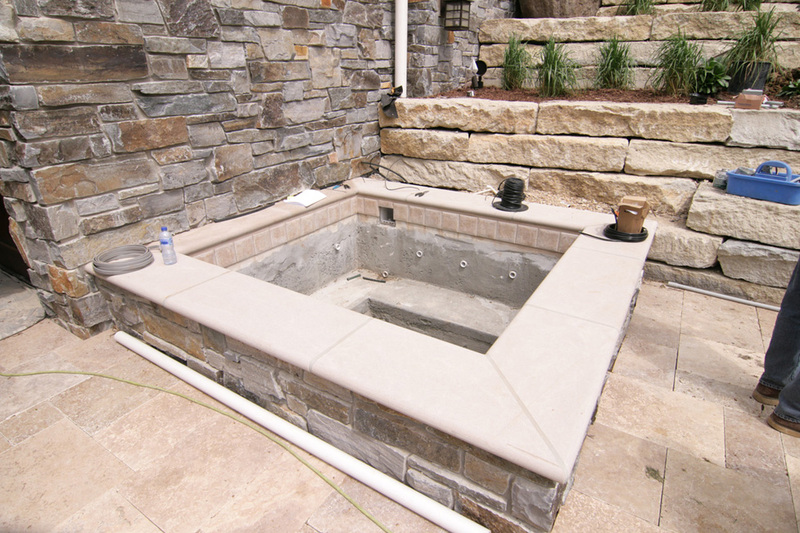 The spa was to be used year-round. 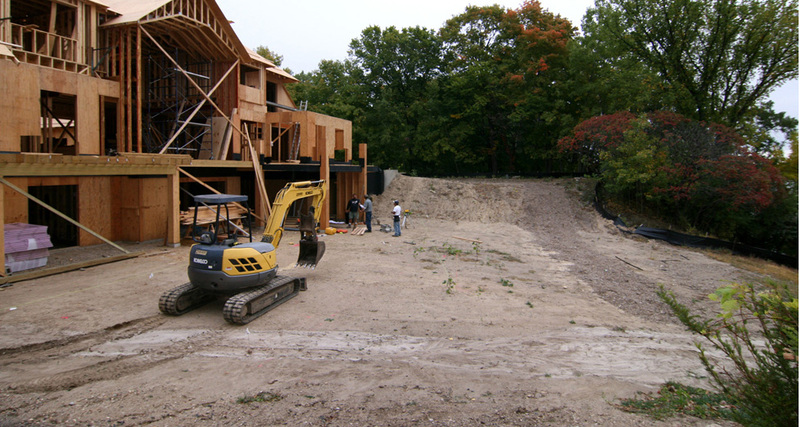 With the location of the home so close to the building set back line from the lakeshore, we had to design a pool and spa that fit their needs as well as limitations of the space due to the restrictions of the property. 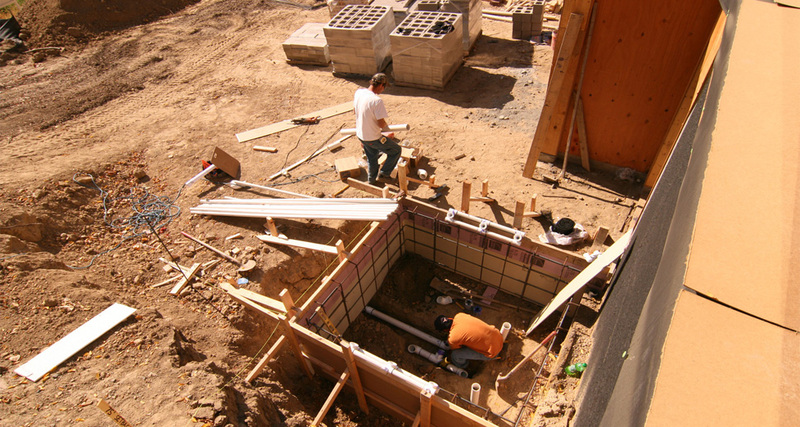 One corner of the spa is 2” inches away from the setback line and another corner of the pool is 12” inches from the building set-back line. 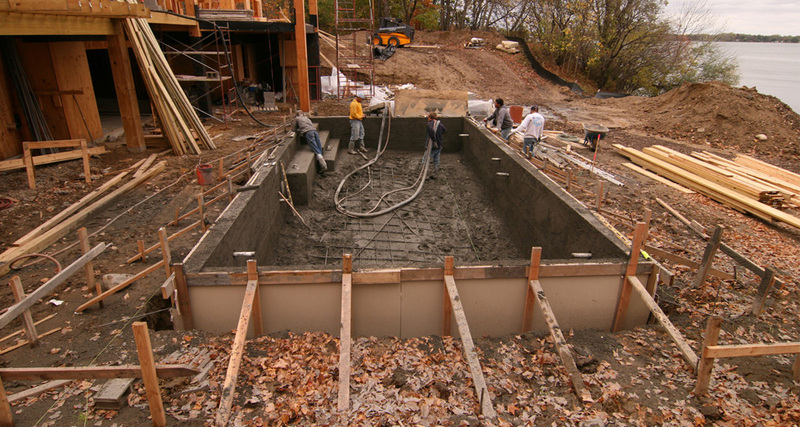 The pool was designed to be elevated 18" above the travertine patio and the lawn area. 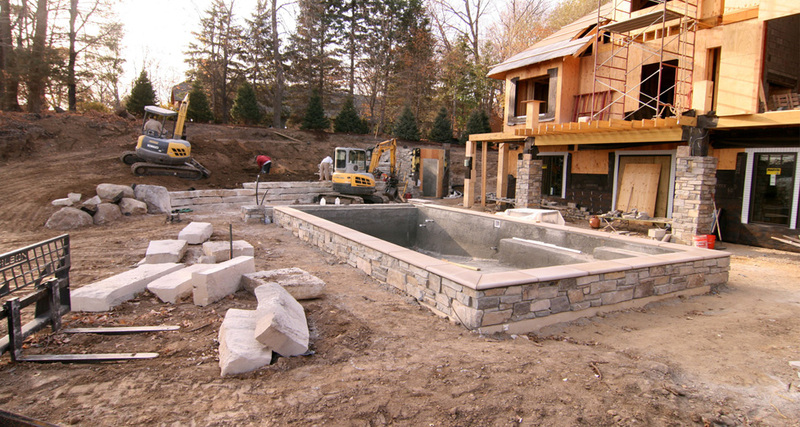 Indiana limestone was utilized for the pool coping allowing for seating around the pools edge. 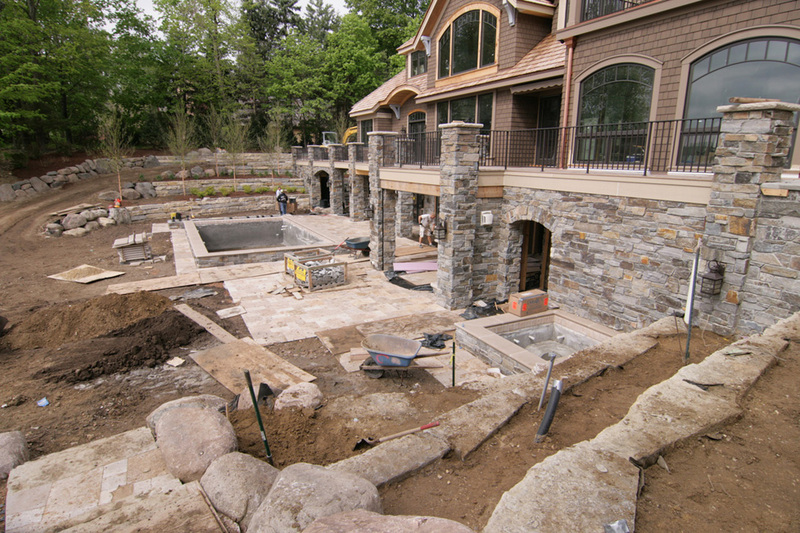 The raised side walls of the pool are mortared stone that match the stone on the house. 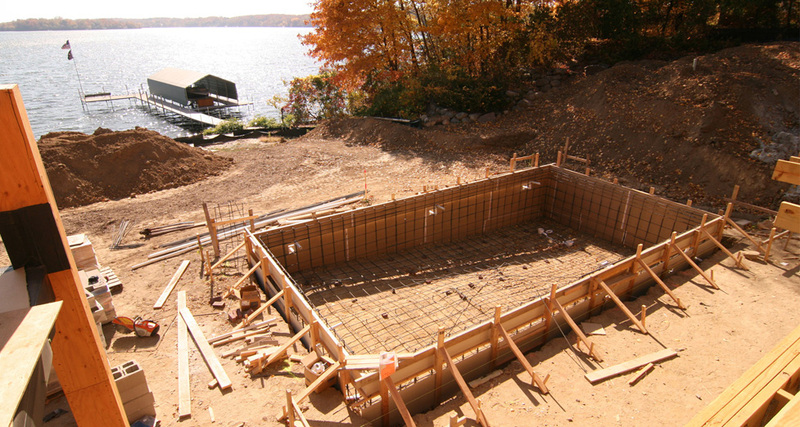 The elevation also allows great views of the lake while swimming or floating in the pool. 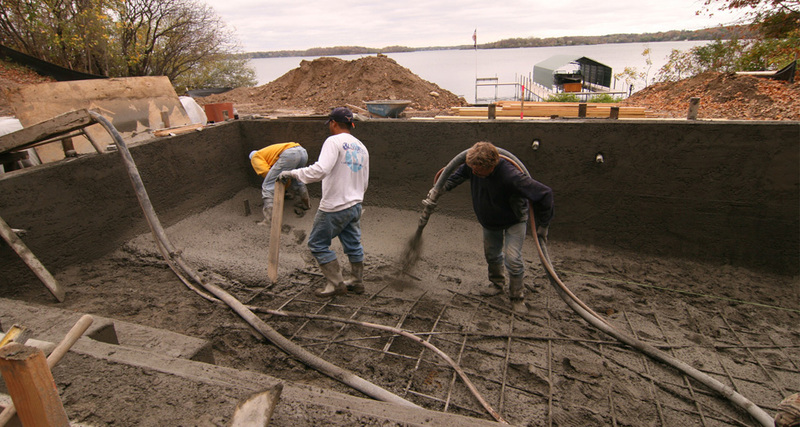 The steps and bench are installed along the house side of the pool to view the lake and keep the ends of the pool clear for swimming laps. 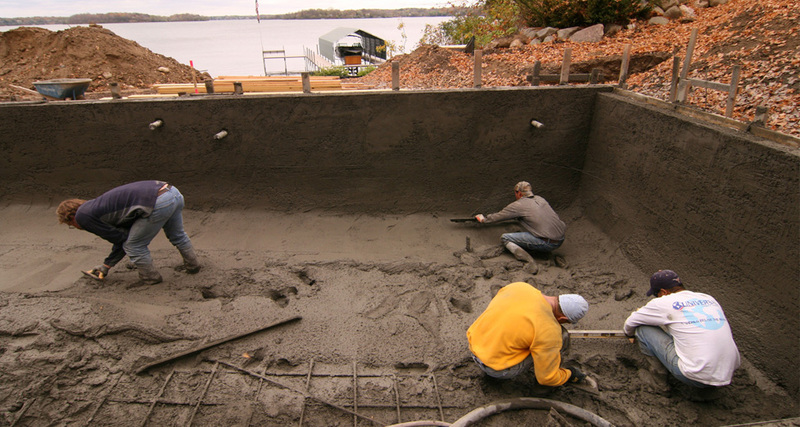 The pool depth is 3’ feet by the steps to 7'6" by the auto cover. 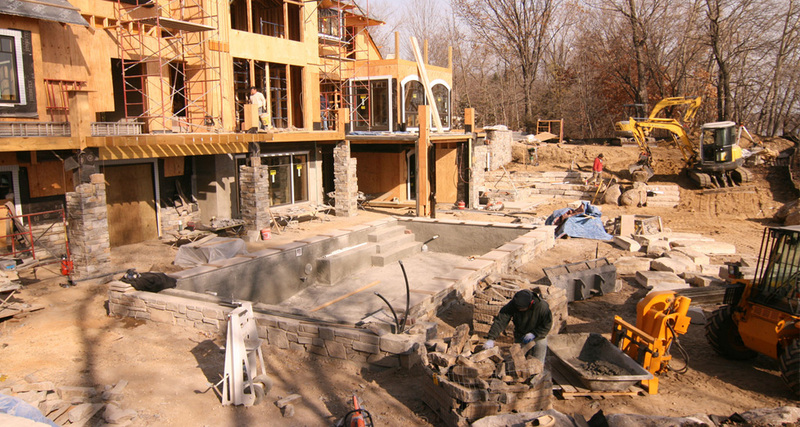 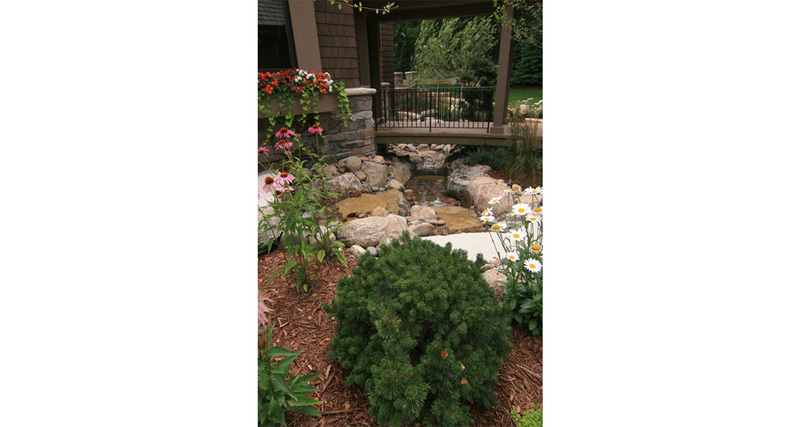 The travertine patio around the elevated pool is installed over a pervious rock system to collect water and direct the drainage away from the house and patio area. 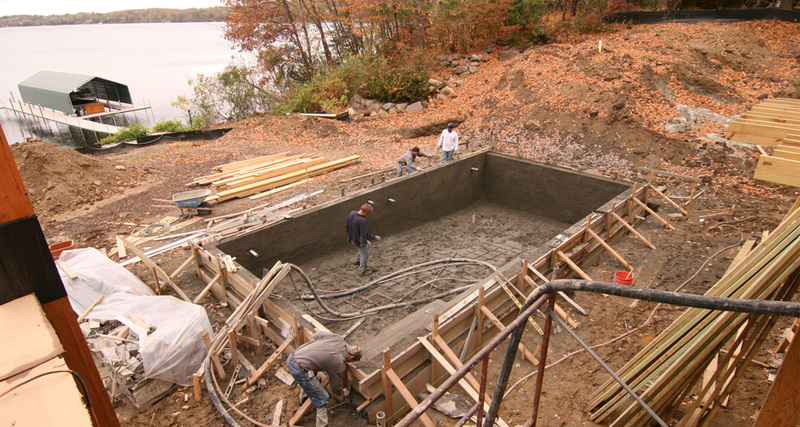 The concrete spa is also elevated to allow views of the lake and is located close to the lower entry of the house. 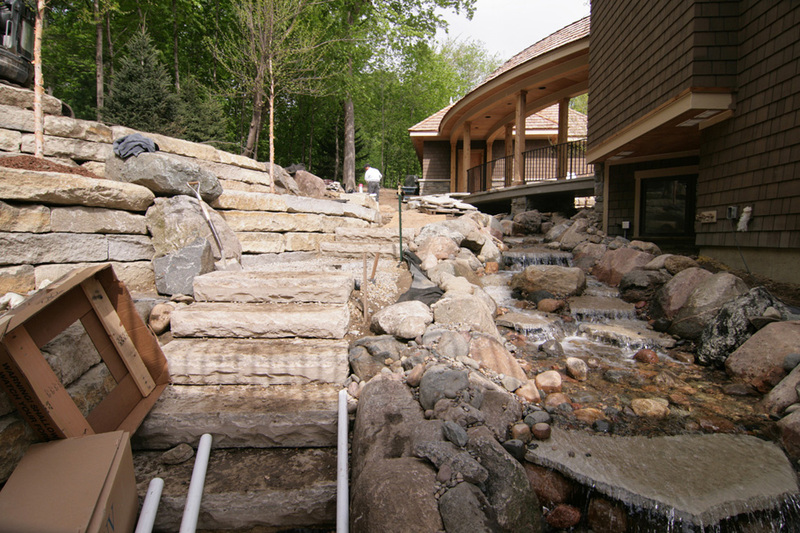 A Wirsbo heating system is located under the travertine patio around the spa to keep the patio free of snow during the winter months. 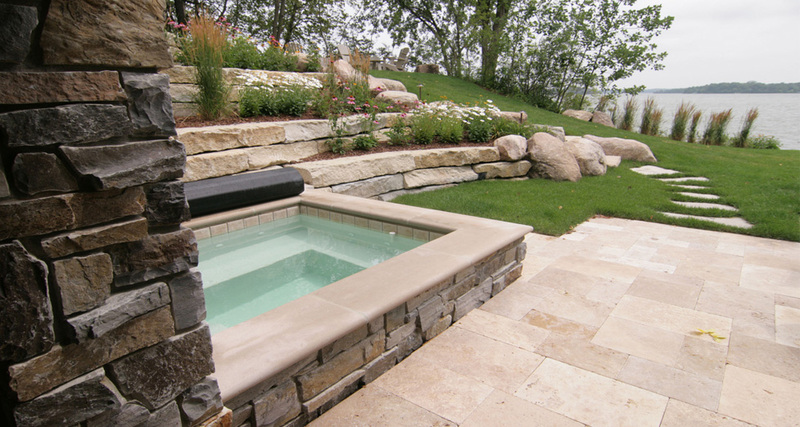 The spa cover is a neoprene pad with cedar strips; spaced 2"apart, to allow it to be easily rolled open during all seasons. 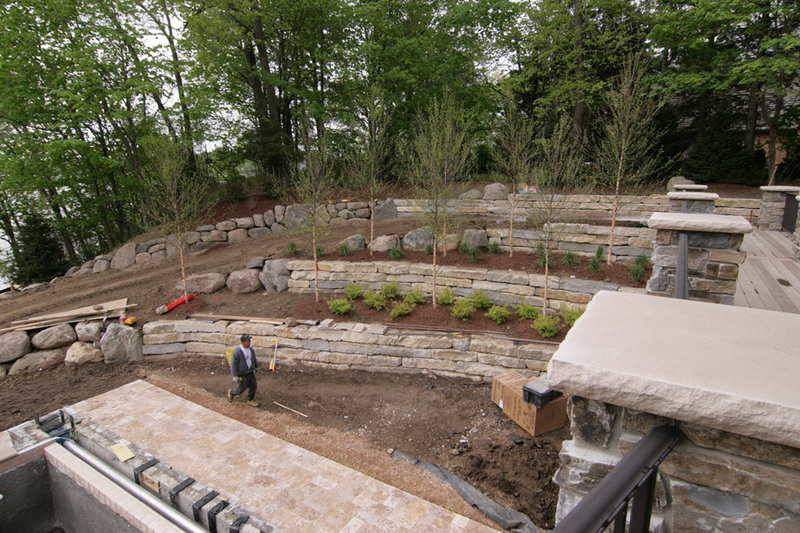 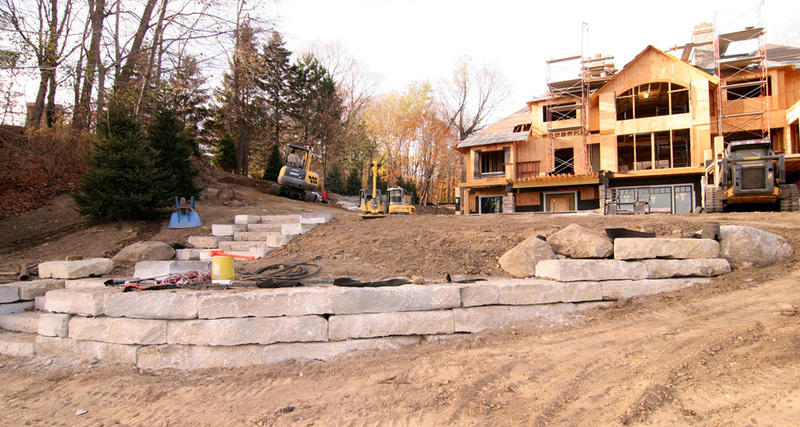 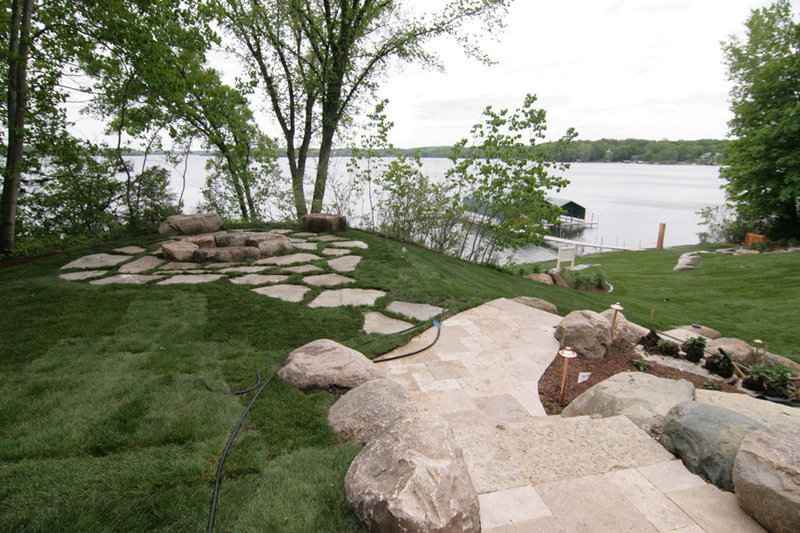 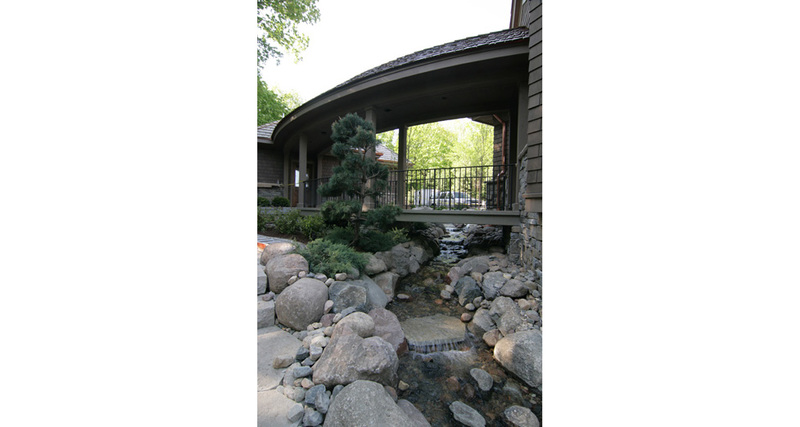 Landscape Design for New Construction Project on Lake Minnetonka. 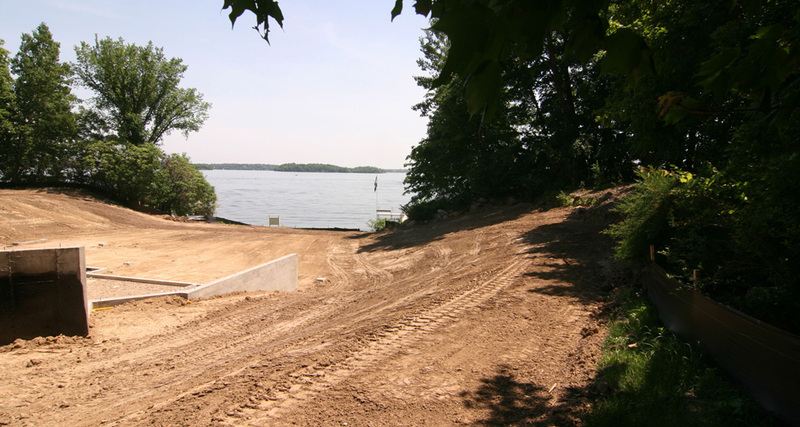 New Construction Project on Lake Minnetonka. 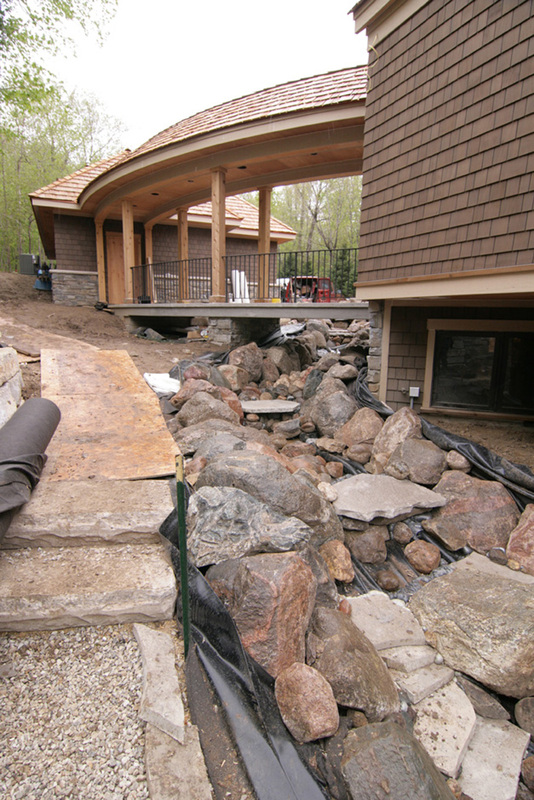 New "Tear Down-Rebuilt" Home on Lake Minnetonka with Raised Concrete Pool and Spa with Travertine Patio. 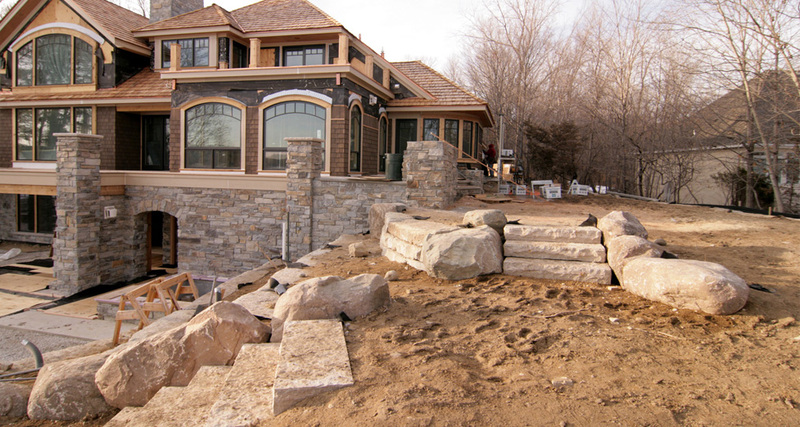 Limestone Staircase with Boulder and Limestone Retaining Walls. 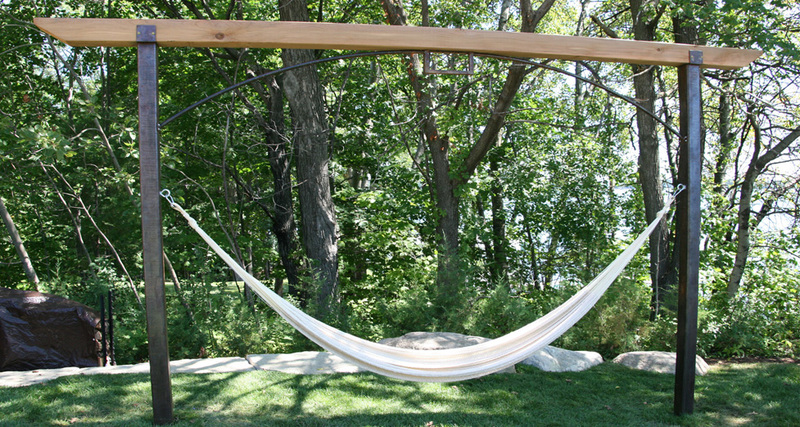 Custom Metal and Woodbeam Hammock Stand.